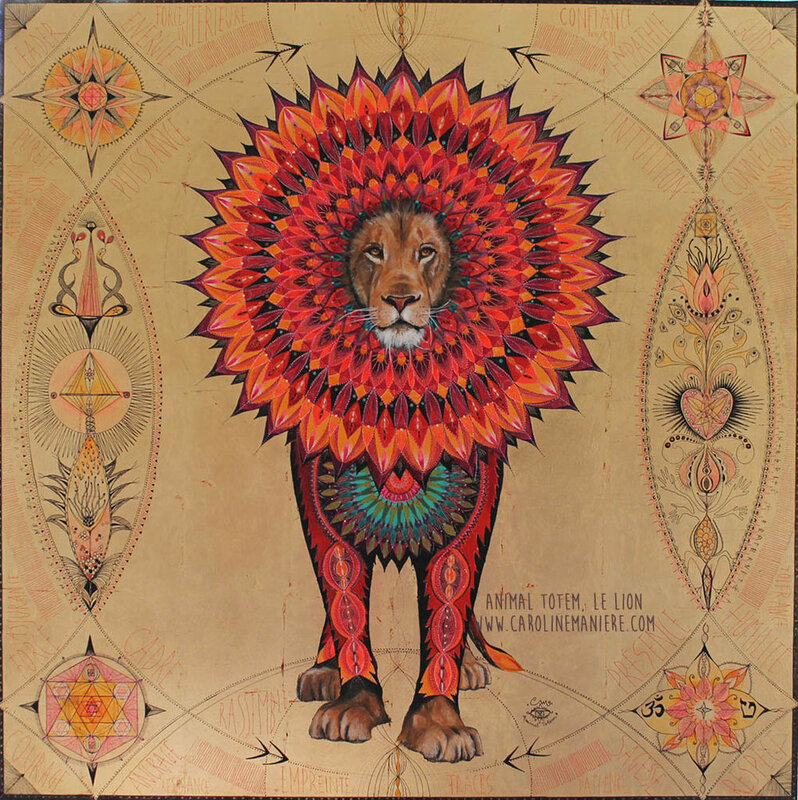 The art of Caroline Maniere really touches my soul- from the colour combinations to the symbolism, I am completely in love with all her work and I am feeling extra fortunate about having the opportunity to discuss her inspirations in this interview. Caroline is a French painter who studied Science at the University of Dijon, where she is originally from. She eventually dropped Science and chose to attend a graphic design school in Paris instead. After 12 years as an art director for a big advertising firm, Caroline decided to return to her first love, fine art. She studied “ trompe l’oeil” technique and began painting on wood and canvas. I can’t remember exactly how or where I found her paintings, but not only do I love the peaceful and “spiritual” aspect of her work, there is a reference to inner reflection and shamanism which I find magnetic. Caroline, you have a very distinct visual identity, its easy to recognize your work, this is a great challenge for many artists how long did it take you to get there? My first painting was of a woman, I wanted to tell the story of her inner journey. So I began painting women, each one coming back from a travel with a key, I called them the "Explorers Collection”.- representing the different faces of the universal woman. Then following my own spiritual path, the work evolved into the « Medicine Women series » and the reason for this was the feedback from my audience sensing healing properties and vibrations from the works , sometimes even a message. The rest developed from there. A door was opened when I began to create therapeutic work, ranging from family constellations, psycho-corporal, EMDR, working on intuition, breath work, Interpretation of dreams and anything to do with personal development. I began reconnecting to my true essence and meaning, a realization of my purpose in life and mission. I truly believe the best work you can ever do is the work you do on yourself. When I had a deeper knowledge of who I was I could paint instinctively and I just followed my intuition. I let the colors and patterns come to me. I paint on copper foil surface because I love how the light illuminates my subjects, in the most respectful and sacred way. Sometimes I start off with an idea, but something happens and everything changes. Also when I paint, I usually listen to shamanic drumming, Icaros, American Indian Native music , mantras…. I also listen to my heart and I let myself be guided on my artistic journey. Caroline, what are your greatest inspirations or influences? What are your favorite websites, publications, or social media handles? Has there been a favorite response to your work so far? Not one in particular, per se, but I get so much wonderful feedback and its so touching to hear that my work is benefitting people in different ways, either transformational, or communicating a sense of peace and good vibrations. Its amazing and I am so grateful to the universe for giving me this tool to receive all this love and good energy. Anything else you would like to share with our audience? These women, men, animals, come to me, to us, they transmit their message, their wisdom, their knowledge, their experience, their power, their brilliance and their vibrations, They accompany us, they reveal and awaken what we bear within ourselves. They remind us of our connection with something bigger than us, Mother Earth. I really connect on energy. If you are interested in my work, I can create a medecine woman, man, or animal, something you connect with, but my intuition is what I use to guide me. The one who comes for you is your sort of avatar, and the work I create brings a special frequency for you, even a message. If you connect with it, you can receive a message, a sense of understanding, energy, the possibilities are quite endless but basically its my love and honor to be the channel and “ medium” for you. you usually send me an e-mail and ask for woman/man/animal/totem. If you want, you can tell me something about you but I don’t ask anything , I prefer to listen to my intuition!